Bluetooth and FM radio receiver are provided by the same ASIC (Broadcom BCM2048). The device supports Bluetooth operation and FM radio rececption in both European/USA and Japanese bands (the appropriate region-specific FM radio band is pre-configured in the phone software). The UART interface allows the device to communicate with the phone baseband engine using Bluetooth HCI commands. Commands to the FM radio can also be sent over the I2C interface. When Bluetooth is switched on, the phone user interface the BT_RESETX line is toggled to reset the Bluetooth device, and commands are sent over the UART interface to configure the device. If UART communication fails (due to a hardware fault) it will not be possible to switch on Bluetooth from the phone user interface. The device has two clock signals: SYS_CLK (19.2MHz, 26.0MHz, or 38.4MHz supported) and SLEEP_CLK (32.768kHz). The SLEEP_CLK is supplied all the time the phone is switched on. To maximise the phone standby time, it is only necessary to provide a SYS_CLK signal when Bluetooth activity occurs, such as sending Bluetooth data to another device, or checking periodically if there are any other Bluetooth devices attempting to communicate with it. At other times when the Bluetooth device is in standby mode or the FM radio is switched on it is only necessary to provide a SLEEP_CLK signal. The Bluetooth-FM ASIC is powered directly from the phone battery voltage line (VBAT). An internal regulator is enabled when Bluetooth or FM radio is switched on. Bluetooth audio signals are sent to and from the device using a PCM interface. The Bluetooth RF signal is routed via a buried track to the Bluetooth antenna on the side of the PWB. An RF filter is needed between the Bluetooth antenna and Bluetooth ASIC to prevent interference to and from the celluar phone antenna. Phones that have both Bluetooth and WLAN use a shared antenna, as both services occupy the 2.4GHz ISM frequency band. The co-existence signaling interface between Bluetooth and WLAN ASICs controls the RF activity in the shared frequency band. The audio signal from the FM radio is routed via the phone Audio ASIC to the phone headset or loudspeaker. The external wired headset is also used as an Antenna for the FM radio. 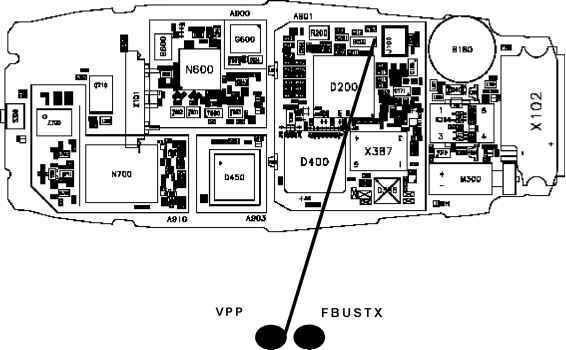 The FM radio receiver RF signal is routed from the ASIC via a buried track to an impedance matching circuit placed near the headset connector. 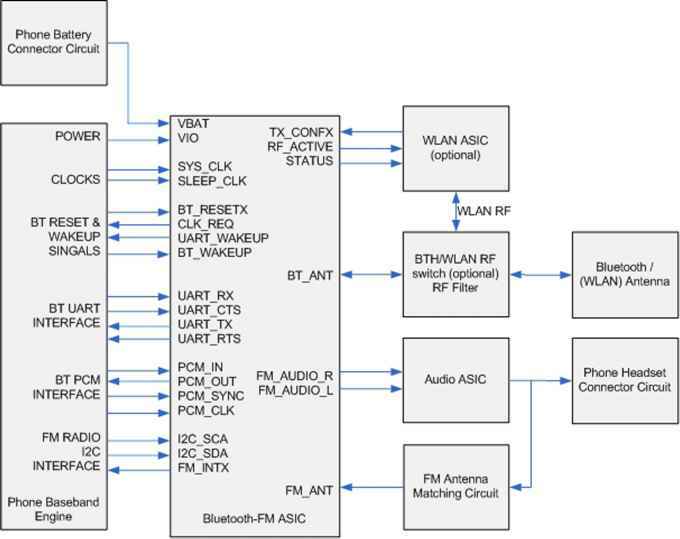 The following block diagram shows how Bluetooth-FM is connected to the host engine.